LONG BEACH, California — Students at the MIT Media Lab have developed a wearable computing system that turns any surface into an interactive display screen. The wearer can summon virtual gadgets and internet data at will, then dispel them like smoke when they’re done. In the tactile world, we use our five senses to take in information about our environment and respond to it, Maes explained. But a lot of the information that helps us understand and respond to the world doesn’t come from these senses. Instead, it comes from computers and the internet. Maes’ goal is to harness computers to feed us information in an organic fashion, like our existing senses. The prototype was built from an ordinary webcam and a battery-powered 3M projector, with an attached mirror — all connected to an internet-enabled mobile phone. 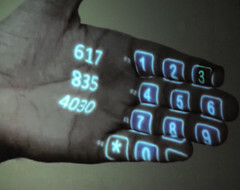 The setup, which costs less than $350, allows the user to project information from the phone onto any surface — walls, the body of another person or even your hand. We at ReadWriteWeb are very excited about next-generation Internet interfaces, such as augmented reality and so-called cross reality. These wearable devices strike me as being the most impressive future Web interface that I’ve seen in a while. Check out the video and see if you agree. I find it extremely interesting because this kind of user interface is build up with very low cost and can therefore be spread easily. Here you can see the first video which demonstrates how a wall is being used to project and interact with several applications. Using a really small projector enables people to project to walls while speaking to a friend standing nearby to someone. Using a projector integrated into a helmet is not very applicable because while you are speaking to your friend the projection is made on your friend’s face. Thus switching to a smaller device hanging around your neck is more applicable as your head is free fro movements. For example someone being in a supermarket and heading from product to product trying to find the cheapeast or most appropriate one is done easily by just scanning the product and retrieving real time information directly from the internet. This has great potential and can be used in a variety of applications. More ressources can be found on Wired.com, on ReadWriteWeb as well as on the Sixth Sense Project Website, on the Fluid Interfaces Research Group Website and at the official site of MIT Media Lab.